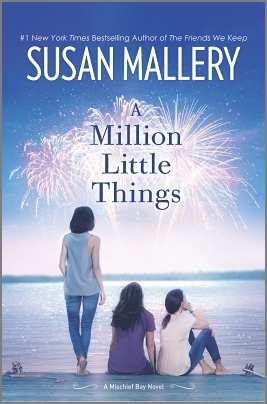 I have to say that I wasn't sure I wanted to read A MILLION LITTLE THINGS by Susan Mallery. I can assure you that it had nothing to do with the book's description or the author -- I always appreciate a story about female friendship and Ms. Mallory is a #1 New York Times Bestselling Author. However, this novel was the third in the Mischief Bay series (and I don't like picking up a new series part-way through it! ), and the story is technically a romance (a genre that I don't normally read.) Despite that, I decided to dig in... and I'm so glad I did! A MILLION LITTLE THINGS tells the story of Zoe, a woman who has just broken up with her long-time boyfriend (a guy no one really thought was good enough for her!) She is pretty secluded, working from home; and her best friend Jen is caught up with her young child... so much so that she kind of ignores everyone else. After a strange accident where she ends up trapped in her attic, Zoe begins to realize that she's by herself way too much with little interaction with people. Zoe hopes to get closer to her long-time friend Jen but finds that she actually begins hanging out with Jen's mom, Pam. In addition, she finds herself drawn to Steven, Pam's son and Jen's younger brother. Things gets even more complicated with Pam starts seeing Jen's dad Miguel. (Can you follow all that?) Zoe isn't sure that a new relationship with Steven is worth hurting Pam and Jen or losing them as friends; however, she also realizes that Pam and Jen have their own set of issues that they need to resolve. Needless to say, these blurred lines between family and friendship are quite complicated! A MILLION LITTLE THINGS is an entertaining story that explores love, relationships, friendships, and new beginnings. I totally understand why Ms. Mallery has had so much success as a writer -- her stories are about real people with real problems... and she does a terrific job of bringing them to life and making readers fall in love with them. I think the strength of this novel was definitely in the character development. I adored Zoe and was totally interested in her story. She was in a bit of a funk when the novel began, especially after getting locked in her attic! ); and I knew it was going to be fun seeing her journey towards happiness. Zoe was struggling with finding herself, but she also had a terrific sense of humor which made her all the more likable. Her friends, Pam and Jen, were also interesting characters who were struggling with issues in their own right; and while they definitely upset me at times, I ended up loving them too! My other favorite thing about A MILLION LITTLE THINGS was how it focused on women and their relationships. Of course, there was some romance in the story, but it wasn't over-the-top -- it was actually very sweet. However, the true themes of the novel were about friendship. Even though there were issues in each woman's life that challenged their relationships, ultimately these three came together and realized the value in their friendships. I really loved that about this novel! A MILLION LITTLE THINGS will be available the beginning of March. I recommend it to fans of the Mischief Bay series and readers who enjoy a sweet story about women and love! I haven't read this series or author but know plenty of people who like her work. You've made me think I need to read this one. This sounds good. Sometimes romance books don't do the greatest job of developing the characters.